STEPWISE WEIGHT LOSS III continued..
Got tired of dieting and gaining back the lost weight and probably more? Well, don't be disheartened as you're not the only one, there are many people out there with the same story. Instead of going on a diet plan for a few days and gaining back those calories later, why not opt for a healthier diet daily and maintain both weight and fitness? Sounds logical & more beneficial right? What then should be your daily diet like? The most effective way to loose weight is by consuming more proteins. Regardless of its source, whether pure, plant, milk or quality proteins, incorporate them in your diet. Among other benefits they fuel fat & calorie burning. You may jumpstart your breakfast with choices like eggs, skimmed milk, low fat Swiss cheese etc. A lot of latest researches suggest that drinking coffee has several health benefits. One such is metabolism boost up! Hence, have that sugarless black cupa-coffee happily. Go Green. Rich in powerful antioxidants that improve your body & brain functions, green tea health benefits are no longer a secret. So why not get used to the sugarless version of it? Much demonized coconut oil has recently been crowned as a healthy all-rounder. 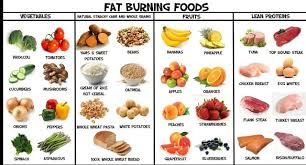 Studies have shown that it does not only burn fat, decrease appetite and aid in weight loss but also keeps the heart and skin healthy. Try replacing your cooking oil with coconut oil. Avoiding sugar is almost impossible as it occurs in many food items like rice, bread and pasta. But you can avoid its direct consumption from sweets, sugary drinks and desserts. Sugar in any quantity activates a hormone insulin which has a fat storing function in the body hence, the more sugar you down the longer you stay in fat-storage mode. Eat less refined carbs like white bread and white pasta. Prefer low carb diet like spinach, carrot, broccoli, salmon and fruits. Remember, fibre is your friend. High fibre keeps you fuller for longer, cuts cholesterol and aids in blood sugar control. Incorporate in your menu, items like brown rice, whole wheat pasta, chapati/pulka, popcorn and oatmeal. Fill your plate with healthy vegetables and fruits. Alternatively, you may choose to use them for snacks. Instead of going for chips, pizzas and burgers you may munch on carrot or cucumber sticks or opt for an apple. You may supplement your meals with whey protein. Eat more of real food. Fresh fruits and veggies like oranges, onions, red bell peppers, broccoli & spinach are rich in antioxidants which play an important role in prevention of diseases, ranging from cancers to Alzheimer's. Do not diet, instead eat healthy. Diet plans and their effects are short lived with rebound weight gain in the long-run. On the other hand, eating healthy may not immediately give you the desired effects but ultimately it will keep you healthier and fitter. Click here for the next step.